Secunderabad, January 14: Celebrating the buoyant festival and the first one of the year, ‘Makar Sankranti’ have strained the Indian youth and cultured masses..! The harvest festival, a celebration of life and vitality, the gala holds great historical and religious significance. It is the festival of Sun God who is often regarded as the symbol divinity and wisdom. 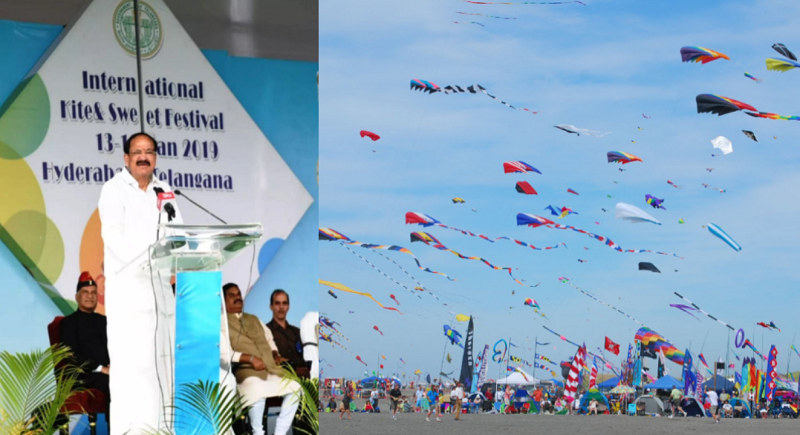 The Indian Vice President M Venkhaiah Naidu, inaugurating the fourth International Kite Festival and Second International Sweet Festival at Parade Grounds in Secunderabad on Sunday, said that festivals are occasions for social bonding and inculcate a spirit of communal harmony and national integrity. They symbolise renewal, rejuvenation and revival of our traditions and heritage and bring in the sense of togetherness, unity, love and brotherhood in today’s fast-paced world. Naidu tried his hand at kite flying for a few moments. He said the fascination associated with the kite flying transcends age, class, and community. “Flying kites is tremendous experience. Observing that kite-making was an art form, it requires skill, precision, devotion and inventiveness”, he added. “The younger generation must understand the rich and diverse traditions ingrained in Indian festivals and protect, promote and enrich our exceptional culture and folk art forms.”, he urged addressing the youth yesterday. Further sharing the personal viewpoint on the occasion he said, “We witness the coming together of families and communities during such festivals. They are also occasions for social bonding”. “India’s tremendous diversity and plurality made it home to several colourful festivals. We need to understand the meaning and values associated with festivals. They also have deep ties to nature.”, he stressed in relation. As many as 42 professional kite flyers from abroad and 60 from India are participating in the Kite Festival.